The starfish parable is one that Ashley Horsley, co-founder of the Sonder Project and the CEO of 360 Blue Properties in Santa Rosa Beach, had often reflected upon when overwhelmed, be it in poverty-stricken West Africa, or the impoverished American cities in which she volunteers. Then, last Oct. 19, nine days after Hurricane Michael transformed the Northwest Florida landscape, Horsley, in her own backyard, felt like a grain of sand in a sea of destruction as she surveyed what the storm had wrought and tried to lend a helping hand. At the end of the day, Horsley and 25 other volunteers tarped roofs and cleared the yards of eight homes in the Springfield and Millville areas of Bay County while also engaging in more personal gestures. They witnessed a woman reunite with her lost cat, Feisty, and furnished her with food for her pet. Horsely paused to spend time with an elderly woman who was in her car seeking refuge from the sun. Horsley has been working to make a difference in the lives of others since since 2014, when she and her business partners, brothers Jeremy and Jason Sprenkle, and employees of YOLO Board and The 30A Company, formed a committee that makes contributions to deserving organizations. As for the latter, the Sonder Project has focused efforts in Burkina Faso, one of the poorest countries in West Africa. Though initially focused on building schools, the Sonder Project soon realized that, without access to clean water or food, no one could focus on getting an education. Back at home, Sonder’s community garden projects combine with organizations such as Food for Thought to make fresh produce available to financially strapped families and improve their eating habits. Given its history of supplying food, water and shelter, the Sonder Project was inundated with calls for help post-Michael. It helped that 360 Blue, a vacation rental company, has ready access to maintenance materials, trucks, trailers and all the required waivers. At this writing, Sonder Project teams are traveling to Bay County Monday through Friday. Some days are devoted to distributing fuel and personal hygiene products. Others may involve serving thousands of hot meals from an impromptu soup kitchen. 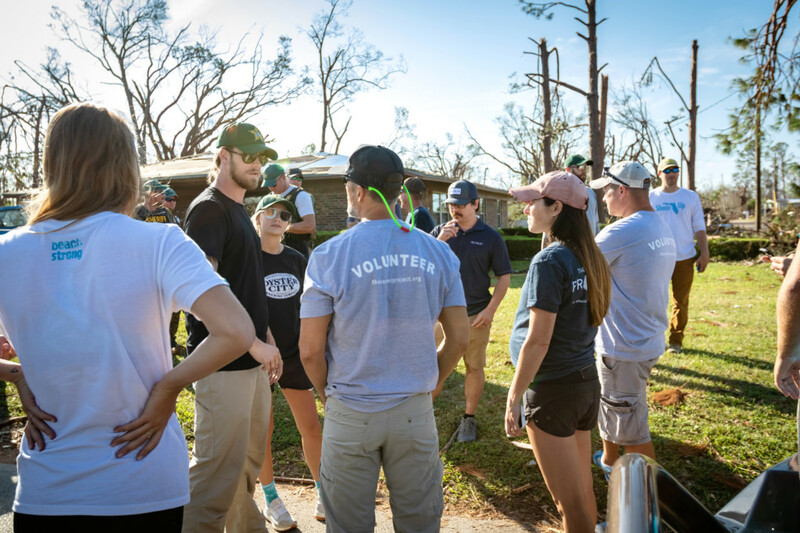 Country music star and Grayton Beach resident Brian Kelley of Florida Georgia Line has been an especially active volunteer. Kelley, who operates a Santa Rosa Beach clothing store, the Tribe Kelley Surf Post, with his wife Brittney, also initiated the “Sonder Challenge,” making a $5,000 contribution toward hurricane relief, and others to follow suit. Many have. Businesses including Bontemps Interiors and The Henderson, as well as Jack’s Beer and Burger Joint in Birmingham, Alabama, were quick to pay their $5,000 forward. The Destin Charity Wine Auction Foundation (DCWAF) donated $21,447 to the cause. The names of good Samaritans, both familiar and inconspicuous, appear on the growing list of donors at TheSonderProject.org. As of November, the Sonder Project had collected $365,000 toward a $500,000 goal. The hurricane was estimated to have resulted in $4.5 billion in property damage, but the half million will make a real difference to the people the Sonder Project reaches. In addition to dealing with the physical devastation, communities are mourning their lost sense of home and belonging. Horsley said the Sonder Project made it a priority to try to establish some normalcy. It sponsored a Halloween party in Millville’s Daffin Park, where children decorated pumpkins, enjoyed bouncy houses and danced the Monster Mash. Over 200 pies were donated by community bakeries and distributed door-to-door (and tent-to-tent) on Thanksgiving. And, in the spirit of an angel tree Christmas program, the Sonder Project adopted families victimized by the storm. So it is that Horsley and company will keep picking up starfish as best they know how.